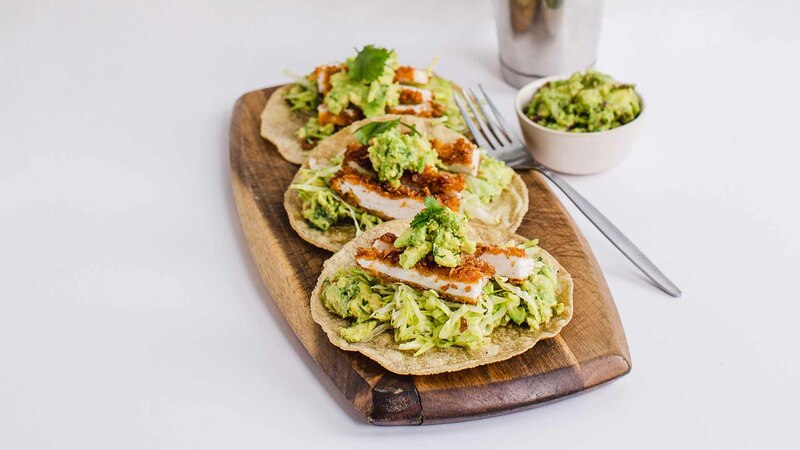 Mouthwatering tacos, filled with juicy chicken and guacamole. 1. Fillet the chicken breasts into four servings. Pat dry with paper towel or clean cloth. Season with salt. 2. Put the flour on one plate, the egg in a bowl and breadcrumbs on another plate. Coat the chicken with flour, coat with the beaten egg and roll in the breadcrumbs to coat completely. 3. In a deep fryer or saucepan, heat enough oil that will allow the chicken to submerge. When hot, and fry the chicken fillets one or two at a time depending on the size of your fryer. Fry for 6–8 minutes or until golden brown. Drain on a wire rack. 4. Heat tortillas in the oven for 1–2 minutes. Alternatively, heat a frypan and add the tortillas, one at a time. Cook for 1–2 minutes each side. Keep warm while you heat the rest of the tortillas. 5. To serve, slice chicken breasts into thick strips and place on the hot tortillas. Add the lettuce and guacamole on top of the chicken. Recipe extracted from Tacos by Ricardo Amare del Castillo, published by New Holland Publishers. RRP $39.99 available from all good bookstores. Restaurateur Ricardo Amare del Castillo is the author of TACOS: Authentic Mexican Tacos the Playa Takeria Way, published by New Holland Publishers.